Istanbul: Turkish police on Sunday fired tear gas and rubber bullets to disperse thousands of people determined to have an annual Lesbian, Gay, Transexual and Bisexual pride (LGBT) march at Istanbul's iconic Taksim square. The square and Istiklal street, one of Istanbul's busiest touristic streets, were decorated with rainbow colours symbolising the LGBT community colours and was readied for the parade days before Sunday. "We refuse to fit the 'normal' stereotype," Xinhua quoted the Pride Week Committee as saying in a statement. "It is not due to nature, nor is it a disease. We are not normal! We do not accept it! We are neither wrong, nor we are alone. We refuse to accept stoic norms or what is deemed 'normal.'" Around 5,000 riot police and numerous water cannons were positioned in the square and neighbouring streets from early morning in order to prevent the crowd from gathering in the square. 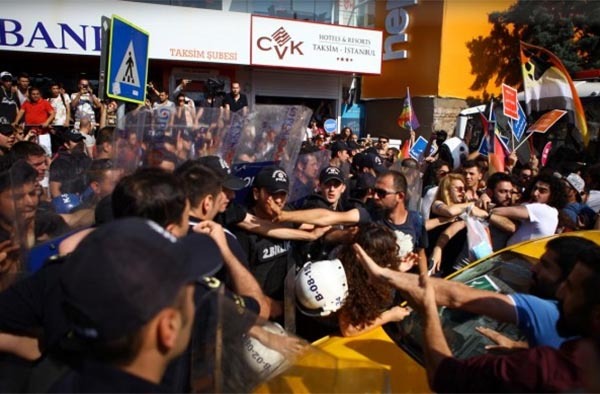 Parliament members from the pro Kurdish People's Democratic Party (HDP) and People's Republican Party (CHP) attempted to negotiate with the riot police in order to convince them to allow the crowd to march. MPs formed a barricade between riot police and the crowd by holding hands. This year's annual parade was considered significant after the US approved gay marriage in all its states. "I hope the US's decision to permit homosexual marriage in the country will set an example for Turkey. We are here to make our voices heard," said Melih Meric, an activist. The crackdown by police on activists reflects the government's official stance on homosexual culture in Turkey. Turkey's homosexual culture differs from that of Western countries, as is the case with Turkish culture. Turkey was influenced by both Eastern and Western civilizations since it is geographically located at the intersection between Europe and Asia.